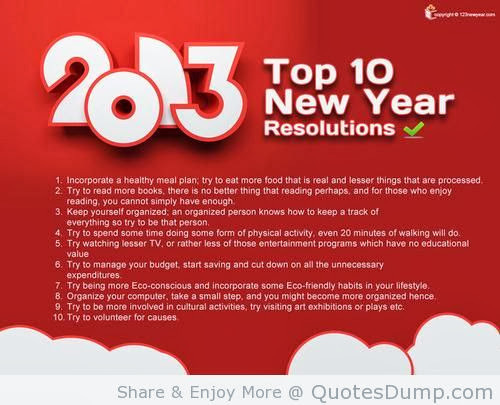 Here are the most popular New Year's Resolutions for 2013. They look fairly typical...lose weight, exercise more, and spend less. As this year comes to a close, take a moment to think about any resolutions you made for 2013...and then ponder on how many you actually kept. If the answer is a big fat zero, don't despair. Remember, every day is a chance to start over. We don't have to wait until January 1st to have a clean slate. Today is a good day to take the first step in the direction you want to travel.